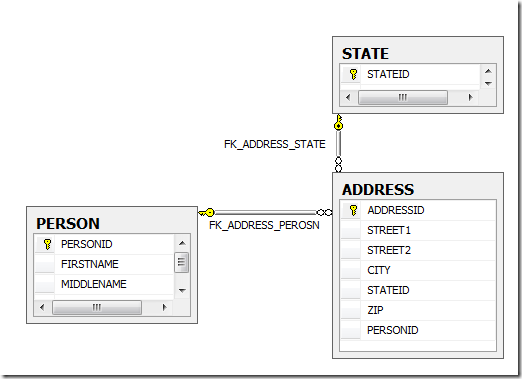 There are three approaches to key in multiple rows into a single table in SQL Server database. One of them is comma separated list, discussed in this post. Frequently there are scenarios here you might be required to key in multiple rows into a SQL Server database table. In order to do that with minimum number of calls and a low memory footprint, there are several approaches available. I know of three, of which I am presenting the comma separated values (CSV) list approach. 1. Passing a comma separated value (CSV) list to the database and parsing it at the database level with the help of a user defined function to split the list into rows and inserting those rows. 3. Using Table Valued Functions, a feature that SQL Server supports version 2008 onwards. All the three approaches are valid approaches and usage depends upon the kind of constraints that you are operating with. I was dealing with a legacy codebase, that did not afforded me the luxury of table valued parameters, which is the most straight forward and efficient way of accomplishing this, and had to settle for the CSV list and eventually the XML way. In this post I will be covering the CSV list method. The comma separated values list method requires the following main ingredient: a user defined function that can be used to split text on the defined delimiter. Since this post is all about demonstrating the comma separated values list approach, I will not delve into the internal mechanics of such function. I just grabbed the first function that I could get off of the internet, and made it work. I got the split function from the following url: SQL Server Forums - Best split function courtesy of the member Corey alias Seventhnight. 1. Parse the information that needs to be stored in the database in the form of a CSV list. 2. Pass it to the database packed in an appropriate type of parameter. 3. De-serialize the information into a table variable with the help of the aforementioned splitter function. 4. Depending upon the total number of columns in the target table, run a combination of insert and update commands, fetching the information from the table variable. A combination is made this way in order to minimize the disk activity, and complete the operation in as short duration as possible. 1. 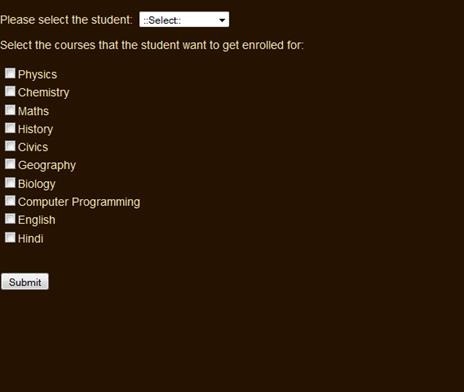 There are two parameters in the stored procedure – The student ID of the student, who needs to be enrolled, and the courses passed as an nvarchar(max) parameter representing a CSV list of the courses in which the enrollment needs to be done. 2. 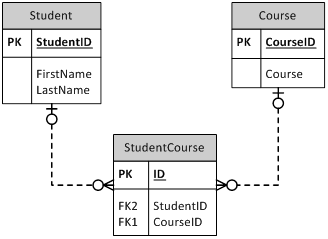 The procedure uses a table variable that mimics the table structure of the StudentCourse table, sans the primary key. 3. Insert command is carried out on the table variable, with the CSV list comprised of the courses passed to the splitter function. Since out splitter function returns a table, with two columns – ID (int type identity column), and Data (nvarchar type), we can right away leverage the Data field, and insert it into the table variable by carrying out required conversion on the fly. Here I am converting the Data to integer, since CourseID is of type int. 4. Once the insertion has been done, I update the StudentID field in the table variable with the passed parameter value. 5. Once this is complete, I ran the Insert…Select… command to key in data into the final StudentCourse table. Depending upon the settings in the database, this will be a minimally logged operation, thereby giving you speed benefits. Note that this is an overly simple example of the stored procedure, not employing transaction, error handling etc. and is meant to convey the concept of usage of comma separated values list in inserting multiple rows. 1. Model the table variable after the final table that is supposed to receive the data. 2. Insert the most variable information in the table variable first. 3. 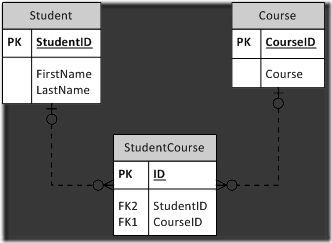 Follow up the insertion with updation of table variable with information that is not changing much, like the StudentID in this example. It remains constant for all the courses inserted into the table variable. 4. If you need selective action within the table variable, make use of an integer type identity column. In this example, we did not require that. 5. The complexity of the procedure will depend upon the total columns in the final table. The more the columns, the more the number of update commands. There will also be a loop that you will have to manage in order to update the table variable with the right row form the table emitted by the splitter function. In the next post I will cover how to insert multiple rows in SQL Server database using XML. 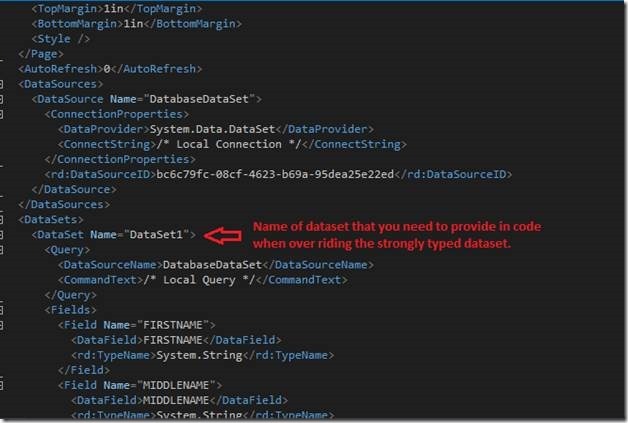 This post explains the caution that one needs to excercise when overriding a strongly typed dataset with an in-code dataset to power a Microsoft Reporting Services report. A Microsoft Reporting Services report needs a strongly typed dataset to work with, but it is generally overridden with an in-code dataset that is used to power the report. The report is sensitive to the name of the in-code dataset, and only works if provided with same name as what gets recorded in the XML innards of the report. Recently I got an opportunity to help a team shift their reports from Microsoft Reporting Services (MRS) to SQL Server reporting Services. Now I had left working with Microsoft Reporting Services back in 2010, when my team migrated all the reports to hosted SSRS environment, so I spent some time creating a simple yet effective proof of concept ASP.NET application working with a Microsoft Reporting Services report that I can show to the team in transition, on how import MRS reports in hosted SSRS environment. Nearly two-third of my time got spent in dealing with a quirk in Microsoft Reporting Services, which is providing the correct name of the dataset in the code, as the report wants it. I remembered this quirk from my days of working with Microsoft Reporting Services, but had forgotten the specifics of remedying the problem. 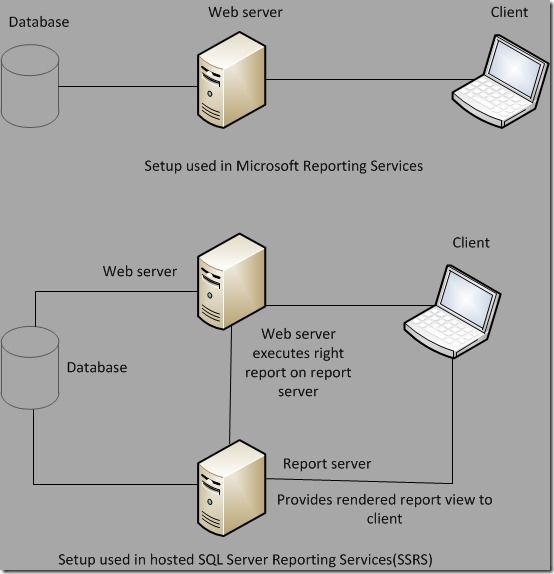 Microsoft Reporting Services is a port of SSRS that produces report(s) you can store in an ASP.NET application, along with the app contents and use the computing resources of the web application server to process data and serve the rendered view to the client. SSRS reports are bit more capable, easier to work with and can be offloaded to a dedicated report server, and thus computing resources (compute cycles, memory, bandwidth etc.) be saved on your primary web application server. Microsoft Reporting Services reports are a good choice when your reporting needs are simple, report generation is less frequent, and when on a shoe string budget. Otherwise, try to always opt for hosted SSRS environment. 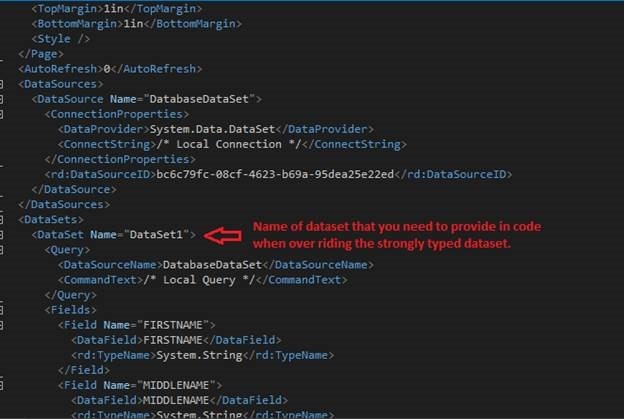 Microsoft Reporting Services requires a strongly typed dataset to work with, and process data from it. 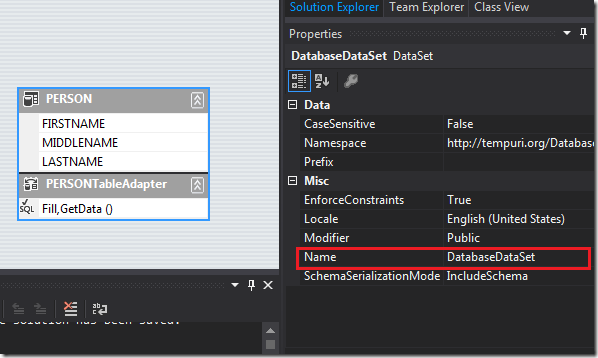 For SSRS the requirements are the same, but the process of making and dealing with a strongly typed dataset is easy and somewhat hidden. Both the types of reports use Report Definition Language (RDL), a format used to convey the report contents and related artifacts. RDL in turn is based on XML, which means that RDL is case sensitive and any change in the schema can potentially render your report unusable. SSRS reports inherit the extension of “.rdl” while Microsoft Reporting Services reports end with “.rdlc” extension, with “c” in “.rdlc” denoting client, i.e. processing at application server. 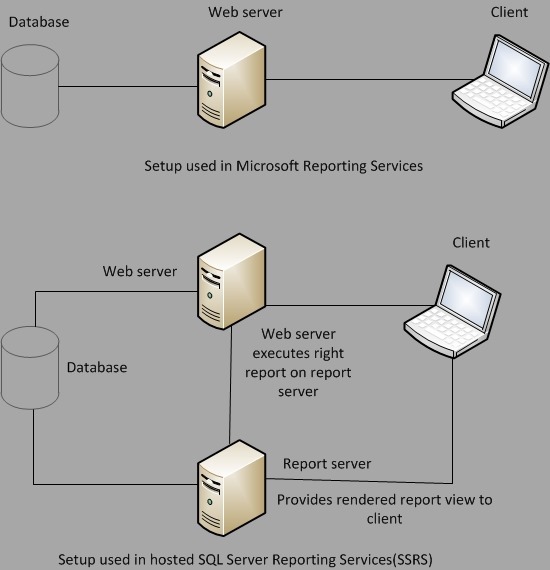 Now that we have understood a little background about the Microsoft Reporting Services, let’s understand the quirk. Almost always, when developers deal with Microsoft Reporting Services reports, they make a report with a very simple strongly typed dataset; connect artifacts on the report with this simple dataset (tablix, matrix, charts etc. ), but then override this dataset in their application code, containing data table(s) filled with data from the actual query that essentially produces the same columns, but different data qualitatively. I usually do this because strongly typed datasets cannot be de-bugged, and they are generally more time consuming to deal with than actual verbose code. Once the functionality to override the dataset is in place the strongly typed dataset can be removed entirely. But till the overriding facility is not in place, you have to retain the strongly typed dataset in place, otherwise the report won’t build. Here I present a simple example consisting of three tables in a data model. The tables are self-explanatory in nature. I have filled the tables up with some junk data. I will use these to make a report in an ASP.NET Webforms website, and will show where one needs to be careful in producing code that over-rides the strongly typed dataset powering the report. Use case: I might bind a tablix on an MRS report with a simple query of “Select FirstName, MiddleName, LastName, DateOfBirth from Person”. 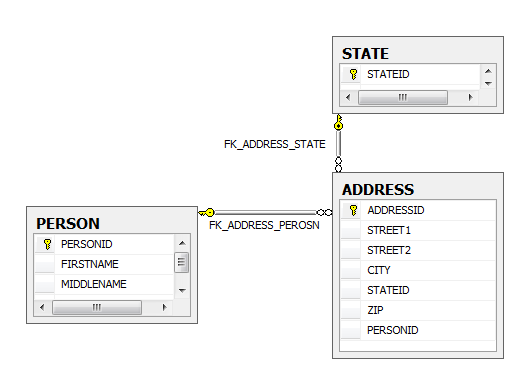 While the actual query that I want to run is “Select FirstName, MiddleName, LastName, DateOfBirth fromPerson inner join Address on Person.PersonID = Address.PersonID where Address.State = @State” to get me details of people living in a certain state. So the columns that need to go on report are the same, but the data that will now appear is different qualitatively. Figure 3 Dataset name appears as “DataSet1” in MRS report powering my tablix. The moment you insert a tablix, MRS is going to prompt to create a data source containing a dataset powering the tablix. 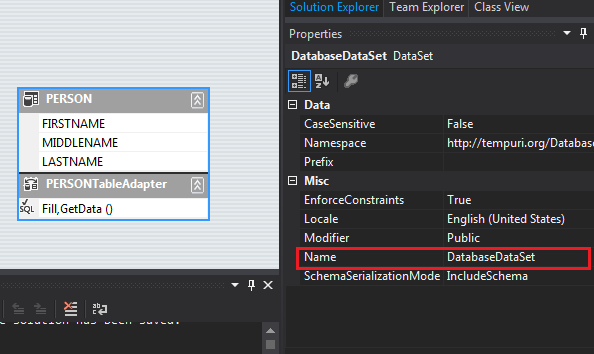 Once you finish the operation, you will find a strongly typed dataset in the App_Code folder of your ASP.NET web application. Figure 4 Dataset name as it appears in a strongly typed dataset. You can double click the typed dataset and get the name of the strongly typed dataset by clicking in the blue section and bringing up the properties. The name came “DatabaseDataSet” came up by default. You can change that, but what matters is what is getting registered in the report. Figure 5 The name of the dataset as it appears in XML that makes up the report is of most importance. Now here’s the code that you have to produce very carefully. Make sure that when you are passing the report data source object to the report, it bears the same name as that of the dataset bound to the report, and more appropriately as found in the XML of the report. It doesn’t matter what is the name of the strongly bound dataset. To see the name as it appears in the report’s innards, open with the inbuilt XML editor or just open it in Notepad and look for the entry with the name. Figure 6 The name of the dataset that you provide in a report data source should be the same as in report's innards. This is quirk is only applicable on the name of the dataset that you need to provide. The name of the data source can be anything, and so is the name of the data table that carries the actual data in the dataset.